The Biennial “Villes en Transition” (Cities in Transition) took place last 9 to 16 March in the French city of Grenoble. This important event for global municipalism and the ecological transition hosted a great number of debates, conferences and cultural events on a wide range of social and environmental issues. On the occasion of these debates, a great attention was paid to the challenges presented by the reception and inclusion of migrants. The UCLG Committee on Social Inclusion, Participatory Democracy and Human Rights supported the organization of sessions on this topic during the Biennale, as well as participation of several international representatives. The need to strengthen alliances between civil society and local government was a key message shared across different events in the Biennial. Through the interventions of Doussou Keita, a local actress and asylum seeker, as well as Grenoble’s Mayor, Eric Piolle, it was recalled that the challenges posed by the concept of “Transition” (in its broad environmental/political/economic sense) can only be achieved if considering the issue of social justice. It is therefore necessary to work for the inclusion of migrants and for the respect of their fundamental rights. An open debate was opened on the occasion of the screening of the documentary “Riace, un paese di Calabria” (Riace, a town of Calabria). Biennale participants and the documentary’s director, Shu Aiello, were able to assess the experience of this small Italian town in terms of migrants’ reception and inclusion. Riace’s Mayor background and commitment, local residents and former migrants established in Riace involvement, as well as newly arrived residents’ perceptions were addressed during the debate. The need to protect human rights universality raised the issue of civil disobedience among the audience, addressing recent judicial sentences against those who have helped migrants. 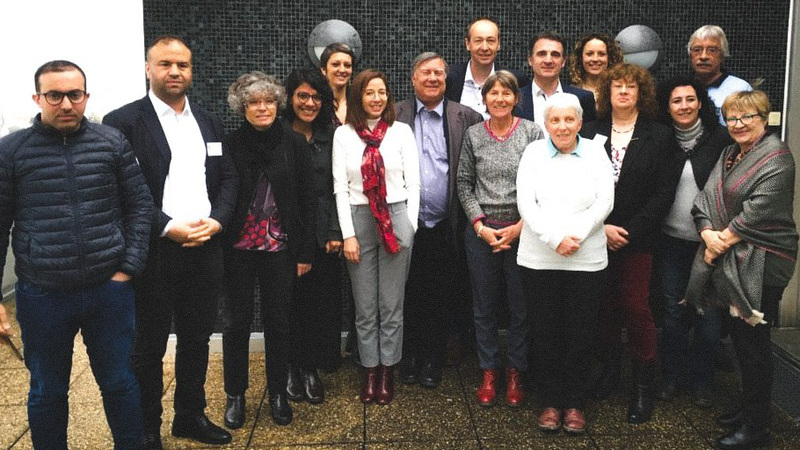 The issue of “crime of solidarity” was addressed several times, after the experience presented by several civil society representatives and researchers, but also of municipal representatives from the French Association of Welcoming Cities and Territories (ANVITA). ANVITA presented its newly formed network, which brings together 40 French local governments organized into five committees: 1) Unconditional welcome and legitimacy of temporary presence; 2) Access to fundamental rights; 3) Protection of unaccompanied minors and young adults; 4) Interpellation against the State and participation of cities and territories in the development of national strategies on migration as well as 5) Citizen awareness-raising and territorial cohesion. ANVITA recalled the importance of connecting initiatives and sharing in a network all that is being done in France on this subject. Network members also expressed their willingness to co-create alternative narratives on migration, and to affirm their collective willingness towards strengthening migrant reception policies at the local level. Our Committee co-organized, altogether with the City of Grenoble, a delegation of international representatives from the cities of Sao Paulo, Nador, Valencia and Barcelona. 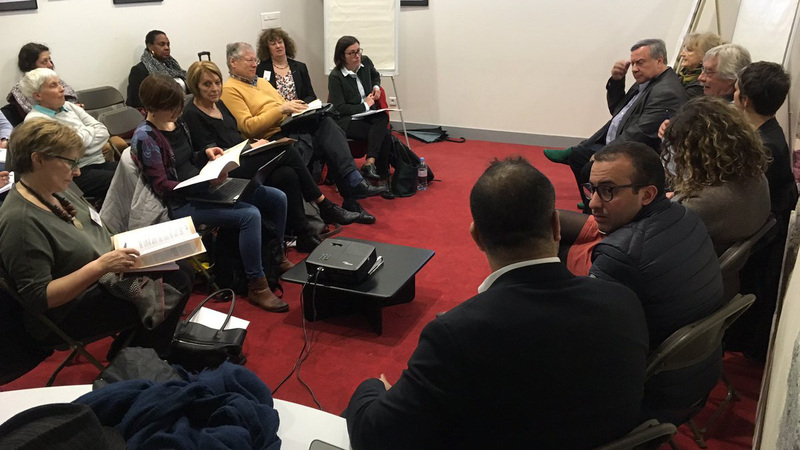 This debate aimed at exchanging perspectives and experiences between those cities and representatives of French territories and cities such as Strasbourg, Briançon, Grenoble, Echirolles, the Auvergne-Rhône-Alpes region and several civil society solidarity networks. In a first time of the workshop, participants were able to address how diverse were their local realities, while seeking points of convergence between them: How to address, as local government, the case of migrants in an irregular administrative situation? What policies can be implemented in the case of unaccompanied minors? How to articulate multi-level governance efforts? How to maintain a stable dialogue between municipalities and associations on this issue? In a second time of the debate, participants addressed the issue of clichés, rumors and hate speech against migration. Concrete proposals were made in order to deconstruct prejudices. A final debate, open to all Biennale participants, was organized under the title “Cities in transition, welcoming cities”. This open meeting paid a cross-cutting attention to the willingness of present local governments to carry out concrete actions on this issue. International representatives revealed numerous examples of concrete policies, such as as informative guides, offices for non-discrimination, councils for the participation of foreign residents, campaigns against racism, support for economic integration... The importance of strengthening networking among cities on this topic was also highlighted, in order to maximize the outreach that local priorities have at the global level, and to put pressure on the national and European levels.